In less than two hours, I will give the introductory lecture in my first course ever. 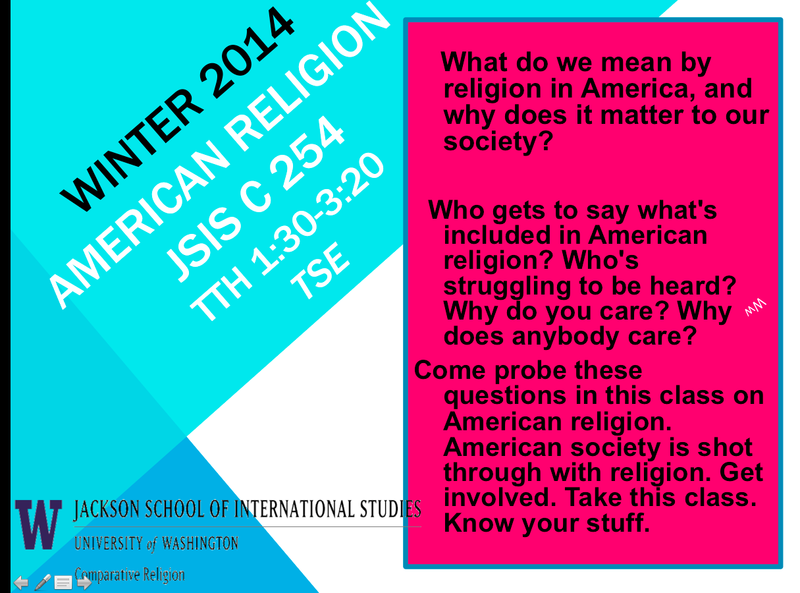 This is a course on American religion, and it is listed as Jackson School of International Studies (JSIS) C254 in the comparative religion unit. This course is about how religion in America may well constitute American civil society more than we might think. The key course question that the students and I will explore together is: what is the role of American religion in the construction of American civil society? While there has been a lot of interesting work on lived religions in America and how Americans may have reshaped religion via the constructs of a voluntary society, this course will look at how religion in America affects American public life. There are four main units in this course. In the first unit, we will explore the making of an Anglo-Saxon Protestant consensus in American religion, and we will do that by reading David Hackett Fischer’s massive tome, Albion’s Seed: Four British Folkways in America. We will then do a second unit in which we look at how this consensus may have broadened out to non-Protestant religions, developed liberal and neo-orthodox strands, and formed some form of American religious pluralism, and to do that, we will read Will Herberg’s class text, Protestant-Catholic-Jew. After that, we’ll problematize the Protestant consensus by looking at race and religion in America. Our key text in this third unit will be James Baldwin’s civil rights book, The Fire Next Time, and we will supplement this unit with articles in Asian American, Chicana/o, and indigenous religions authored by Jane Iwamura, Andrea Smith, Tom Tweed, and David Yoo. Finally, our fourth unit will be on American fundamentalism as we explore the reassertions of the Protestant consensus, and we will read George Marsden’s Fundamentalism and American Culture. To teach a course on American religion is to initiate students into a widely debated field of research. I understand, for example, that the emphasis of my course seems to be on the Protestant consensus in America may lead some to dispute whether I am privileging certain geographies or religions in America, and I am fully cognizant of revisionist histories that provincialize New England (e.g. Jon Butler’s Awash in a Sea of Faith), that seek to frame American religion via the geography of the Americas (e.g. Manuel Vásquez), and that seek to unsettle settler colonialism by emphasizing indigenous religions and relations. My reply would be that to do revisionist history implies still that there is a historical narrative to be revised, and I would argue that my course seeks to do that by positioning the traditional narratives of American religion via the Protestant consensus alongside the revisionist work on race. Scholars of American religion will recognize, then, that the first two units on the broadening of the Protestant consensus can be traced to Sydney Ahlstrom’s seminal Religious History of the American People. However, with the material on race, this Protestant consensus is actively being challenged and revised by groups with different senses of American geography, whether through a trans-Pacific framing (Asian American religions) or an Americas framework (a Chicana/o and indigenous religions). The idea is to look at how the conventional narratives can be juxtaposed with the alternate geographies. As such, this course is a course on how religion can be seen as grounded in American civil society. It is not a history course, and it is not a course where we will tick off each of the religions in America. Instead, it asks the broader question of how American civil society is shaped by American religion, and my hope is that students will emerge from the course with the ability to articulate their perspective on that question critically. While this will come as no news to many of my acquaintances, I am pleased to formally announce that I will be taking up a Social Sciences and Humanities Research Council (SSHRC) of Canada Postdoctoral Award at the Jackson School of International Studies at the University of Washington in Seattle, beginning on 1 January 2014. This is an externally funded postdoctoral award from the Government of Canada that allowed me to apply by proposing an international institution at which to hold the fellowship. The purpose is for freshly minted Canadian doctoral graduates to be postdoctoral fellows as part of an institution’s academic life. My award funds my postdoctoral fellowship for two years while providing me with a base from which to get launched onto the academic job market. I chose the Jackson School of International Studies at the University of Washington because I wanted to be part of an institution where I could augment my studies in religion while being part of a community that valued my disciplinary home in human geography and my topical interest in Asian American and Asian Canadian studies. I was attracted to the Jackson School because of the Comparative Religion Unit directed by Professor James K. Wellman, Jr., who will be my postdoctoral supervisor. As a specialist in Protestant studies, Wellman is a good fit because of his knowledge of mainline Protestant studies (I have found his readings of the Niebuhr brothers very enlightening, particularly as he grounds their work ethnographically; see The Gold Coast Church and the Ghetto: Christ and Culture in Mainline Protestantism) and evangelical studies (see Evangelical vs. Liberal), including in new evangelical paradigms and megachurch models (see Rob Bell and a New American Christianity). I look forward to working with him to develop my interests in American religion while reading and writing broadly around the nexus of religious studies and theology, which means that I will continue to engage the revisionist conversation on secularization as well. The Comparative Religion Unit is also a base from which to network with a diverse range of scholars across departments at the University of Washington whom I plan to engage in conversation about trends in the social sciences of religion. Finally, because the unit is located within the Jackson School, this situates me in an institution that cares about Canada-America relations, human geography, and Asian American/Asian Canadian/trans-Pacific migration and ethnic studies. I plan also to contact geographers and Asian Americanists for further conversation. My postdoctoral project is titled Witnessing in the None Zone: Younger Generation Asian North American Protestants and public engagement in the Pacific Northwest. Following on the heels of my doctoral project on Cantonese Protestant engagements with the public sphere, this project now moves to a ‘younger-generation’ Asian American and Asian Canadian Protestant population and how they engage existing publics while creating new ones. By younger generation, I mean to say that I am not only interested in ‘second-generation’ Asian North Americans who are born in North America, but also 1.5-generation and transnational migrants as well. The project starts in the Pacific Northwest (especially Metro Seattle and Metro Vancouver) because much of the work that has been done on younger-generation Asian Americans has been conducted in California. This approach does not exclude the Californian case studies; instead, it can be a way to compare and contrast newer ethnographic work in the Pacific Northwest with the work in California. The Pacific Northwest is itself important because it has been conceptualized by many as a ‘none zone’ of religious life, and the fact that Asian Americans and Asian Canadians are engaging and creating theological publics in these sites may serve as a challenge to that thesis. By starting in the Pacific Northwest, I plan to later extend my postdoctoral fellowship work to other sites southward (say, to the San Francisco Bay Area, Greater Los Angeles, and sites in Texas, such as Houston and Austin) and eastward (say, to Chicago, Toronto, Boston, and New York), depending on where the connections may lead and whether these publics are bound by metropolitan units (as in my doctoral work) or conceptualize their geographical parameters differently. Again, the project does not focus on congregations, per se; it examines rather how younger-generaton Asian American and Asian Canadian Protestants engage and create publics, including in electoral politics, grassroots activism, planting congregations (one area of inquiry is whether congregational sites are conceptualized as public or private), participating in circulations of material culture, and involvement in social media (this list is not exhaustive! I am preparing to be surprised by my findings!). My plan is to start interviewing key informants at the beginning of 2014. In other words, details are forthcoming. In addition to conducting this new research, I will also be writing papers to submit into academic journals in geography, religious studies, and American ethnic studies, while also converting my dissertation into a book to be submitted to an academic publisher. Finally, in keeping with the regulations of my grant, I will be teaching one course at the Jackson School on American religion in the Winter Quarter in 2014. I will write about that course separately. I look forward to my time in Seattle as an opportunity for further professional development. I anticipate that there will be a lot to learn, and I am very excited to be working with James Wellman. This postdoctoral fellowship promises to be a time that will hone my work on religious and racialized publics, and I am very eager to be challenged in ways that I will not have previously imagined. I am here at the Westin Waterfront Hotel in Boston, MA, at the annual meeting of the Society for the Scientific Study of Religion (SSSR), which is being jointly held with the Religious Research Association (RRA), from 8-10 November 2013. I organized a session for Saturday, 9 November. It’s a paper session titled Faith, Class, and Space: Geographies of Religion, session G-10 on the SSSR program. It will be held from 2-3:30 PM in the Carlton Room, and it will feature geographers who work on religion, including Banu Gökariksel (Geography, University of North Carolina), Anna Secor (Geography, University of Kentucky), and Betsy Olson (Geography, University of North Carolina). Ann Taves (Religious Studies, UC Santa Barbara) is our discussant; this is more than appropriate because Taves was our Annual Lecturer for the Geography of Religions and Belief Systems Specialty Group (GORABS) at the Association of American Geographers’ (AAG) Annual Meeting earlier this April 2013. If you are here in Boston, you are warmly invited to attend. The genesis of our paper session came from a conversation that I had with Lily Kong at the AAG earlier this year. Following Kong’s 2010 paper in Progress in Human Geography (which was incidentally her inaugural Annual Lecture for GORABS in 2010), we discussed the various conferences that geographers needed to attend and in which they needed to intervene in order to spread the word that geographers are interested in religion as an analytic. Having heard from Ann Taves and James Wellman (Religion, Jackson School of International Studies, University of Washington) that the SSSR was a conference that we must attend, I decided to organize a panel with some of the latest work in geographies of religion. Kong herself was unfortunately unable to attend. However, we really did get the cream of the crop in our discipline. Gökariksel and Secor have made fascinating interventions in the intersection of religion and consumption in their study of tesettür, Turkish veiling fashion that is seen as morally and aesthetically ambivalent and yet political in regard to secular states. Olson is presenting work that she conducted with a team of social geographers in the United Kingdom interested in the intersection of religion, childhood and youth studies, and postsecularism; her collaborators include Peter Hopkins (Geography, Newcastle University), Giselle Vincett (Geography, University of Edinburgh), and Rachel Pain (Geography, Durham University). Their collective project focuses on the young Christians in Scotland and factors in class to differentiate different kinds of youth in their sample. These two projects are some of the latest work being published in geographies of religion and represent an exciting turn in the discipline where religion is demonstrably a geographical analytic that, when it intersects with other social factors, presents a powerful entryway into theorizing how the contemporary world is constructed. Images of Chinese evangelical demonstrations against sexual liberalization in San Francisco, Vancouver, and Hong Kong have circulated throughout a global debate about sexual minorities and marriage equality. While anti-marriage equality demonstrators have often been portrayed as motivated by private religious convictions and homophobic sentiments, little has been done to theorize their intersections of race, ethnicity, and class. This paper focuses on one such group: Cantonese-speaking evangelicals in the Pacific Rim. Based on ethnographic fieldwork conducted in 2011 and 2012 that involved 140 interviews and 13 focus groups, I argue that Cantonese evangelical protests against sexual liberalization often invoke a middle-class ‘model minority’ conception of participation in public space as an orderly activity over against lower-class forms of anarchy. While notions of the ‘model minority’ have been anathema in Asian American studies, that Cantonese evangelicals actively invoke their peaceful, legal, non-violent, and non-anarchic approach to public space as a frame for their political activities suggests that fissures along class among migrant religious populations. These analyses must in turn be grounded in space, demonstrating that class differences as to how public spaces are used are illustrative of larger conversations about religion, ethnicity, and class in the public sphere. So far, it’s been a very good and interesting conference. There is a lot of interesting talk about the social sciences and interdisciplinarity. I also attended a very interesting ‘Author Meets the Critics’ session for Julie Park’s new book, When Diversity Drops: Race, Religion, and Affirmative Action in Higher Education. In addition to our disciplinary intervention with human geography here at the SSSR, I am enjoying meeting and reconnecting with people who are also interested in the social scientific study of Asian American religions. All that is to say, I am very glad that I am here, and I look forward to continuing to be productive while I am here.